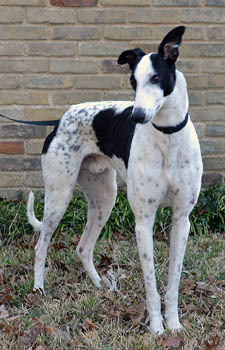 Carlos is a 2-year-old white & black male born November 17, 2010. His sire is Lonesome Cry and his dam is Kayjay Obsession. Carlos has no races to his credit and he was turned in to a shelter by a coyote hunter in Amarillo. 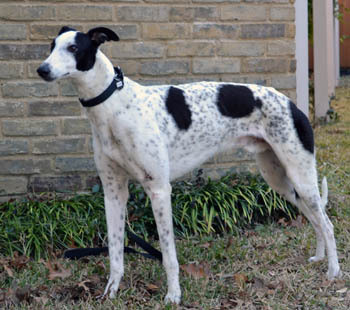 Carlos has been successfully treated for his Ehrlichia Canis and is now ready to find his forever home! Carlos has passed an initial cat test and is living with cats in his foster home.